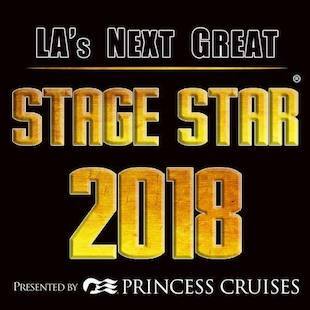 LA's Next Great Stage Star 2018 is once again presented by Princess Cruises with Michael Sterling and Barbara Van Orden serving as Executive Producers and Peter Welkin as Co-Producer. Each event will be presented in front of a live voting audience and five different four-member judging panels composed of southern California musical theatre professional Executive Producers, Producers, Artistic Directors, Theatre Directors, Casting Directors, and Equity franchised Theatre Agents during weeks 1 thru 5; with the August 27 Finale featuring over two dozen returning and additional first time special guest judges. The 2018 first pace winner will receive a cash prize of $2500 and professional Equity Agency representation. The first runner up will receive a cash prize of $1250 and Equity Agency representation. To date, 22 of our former 228 overall contestants have already made their Broadway and/or off-Broadway debuts, with another 50% working in Broadway U.S. National Tours, Vegas sit downs of Broadway shows; in international theme parks, and sailing the world on some of the high seas most prestigious cruise lines. Add to that, commercials, television, and film roles.